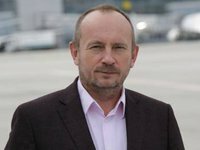 The leading low cost European aviation company Ryanair (Ireland) puts forward the conditions for its flights to Kyiv to the state-owned enterprise Boryspil international airport, which are not in line with Ukrainian legislation, Boryspil airport Pavlo Riabikin said at a press conference in Kyiv on Monday. "First: they demand that disputable issues were solved in London arbitration applying English law. We insist that they are to be settled in Ukrainian courts," he said. Riabikin presented some ultimatum demands of the carrier that do not suit Ukrainian law. Among them are air navigation services free of charge, check in, taxi parking lots, space for advertisement, ticket sale offices, demands about 60-day crediting period secured by the airport, payment of 35% of profit from duty free stores and approval of the passenger fee at $7.50 for five years. As reported, Ryanair announced flights starting in October 2017 on four routes from Kyiv and seven from Lviv. Ryanair Chief Commercial Officer David O'Brien said at a briefing in Kyiv on Wednesday that flights to Eindhoven, London, Manchester and Stockholm will be launched from Kyiv. It is planned to service 15 flights a week. From Lviv Ryanair will fly to London, Eindhoven, Berlin, Memmingen, Krakow, Wroclaw and Budapest. Ukraine will become the 34th country in the airline's network. Boryspil International Airport is the main airport of Ukraine. The airport has two runways: one with a length of 4,000 meters and a width of 60 meters, and the second with a length of 3,500 meters and a width of 63 meters. Four passenger terminals, postal and cargo complexes are located on the territory of the airport.